Winter is over…or so they say. I must admit that I was expecting more April showers and fewer April flurries then we have been experiencing. At least the sun is out, and the thermometer has been rising…fairly steadily. Already I see the neighbourhood waking up from its state of semi-hibernation to start the annual spring cleaning of our homes and yards. What a difference it makes too. Once the sticks are picked up, leaves gathered and garbage tossed the yard looks fresh and clean and ready for the grass to grow and the flowers to sprout. Often we or at least 60% or so of us do a similar “out with the old, in with the new” freshening up inside our homes as well. All that is worn out and broken go out ready for all that is new and lively that comes with the change of the season. On mornings like this though, cold mornings that is, I can’t help but recall the terrible winter from which we are just emerging. I can’t remember such a turbulent year with so many ice storms and wind warnings, and that makes me wonder if the usual round of spring tidy up is enough to cut it this year. Many of my friends and neighbours lost shingles during the worst of the storms, and even though I can’t see any damage from the yard, it may be time to take the trek up to the attic to take note of the state of the place. It is essential to keep an eye on the health of those hard to see areas of your home, but often easy to forget to do so. That is why I like to do it once in the fall and again in the spring. If it is part of the process of putting my home to bed for the winter and waking it up for the spring, then I know my home is healthy and happy, and I can rest at ease….on my patio. Oh come on patio weather, where are you!? If you are checking your attic and crawlspace and other hard to reach, less desirable areas of your home regularly, then you are bound to notice when something is out of place, or off, or just not looking up to snuff. Once a problem is noticed then it can be dealt with in a timely fashion before a small nuisance becomes a big problem. Mold and mildew good examples of these problems that tend to grow…..because well, they do, and they spread, and they colonize, and then they shoot out offspring, and the whole process starts all over again until you have a complete invasion on your hands. So what does mold have to do with ice storms and April showers? Everything. Every crack and crevice and nail hole that is exposed is susceptible to wind and rain. Once the moisture is in your attic, it can settle on your insulation like a comfy feather bed. If the wind also brings in mold spores, or if they were already present in your attic before the moisture set in, then you have a real problem. You see, the days are getting warmer, meaning that your attic is getting cozier and more inhabitable for your little mold metropolis. If there is a tiny village going up, trust me you want to be aware of it now. Now it is manageable. 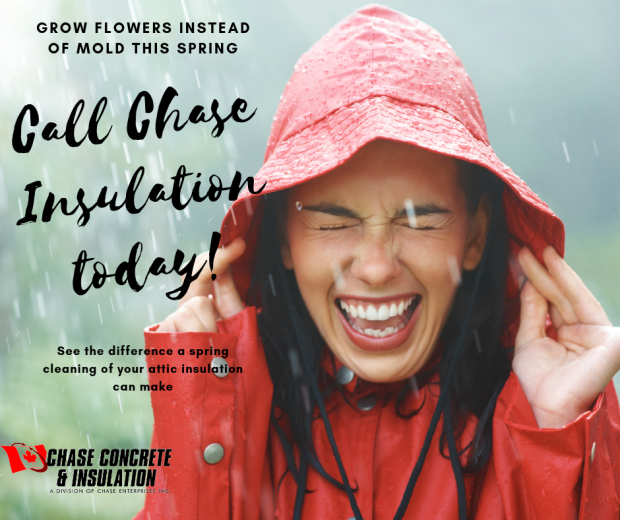 Now you can give us a call at Chase Insulation, and we can come in, assess the situation, remove the soiled insulation and put down some fresh, clean insulation. It is as easy and as important as raking out your flower beds. Our specialists will even sit down with you and explain the many insulation options we have available outlining the pros and cons of each and which option would be ideal for your home. So if you live in Southwestern Ontario then give us a call at 519-678-3977 or visit us at chaseinsulation.ca. Check out our products and services and let us help you get your home ready for spring.